Vendor of Epsilon ES4, ES2 is RKS. Fuel level sensors CAP LLS-A with the analog output can be connected to most systems for monitoring or recording with an analog input. The sensor has no moving parts and measures the level of electronic means. This allows you to extend the life of the sensor several times. 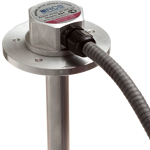 You can use the sensor CAP LLS-A with a strongly alkaline and strongly acidic media. The sensors have a standard mount on the 5 screws.